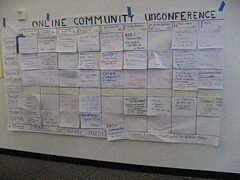 I’m jotting down some notes from the Community UnConference here in Mountain View, it’s amazing how many people are involved with online communities, it’s growing so fast –there are hundreds here from pretty much all sectors and all types of companies. While online communities are nothing new, I was one of the first to have a title at Fortune 500 company, as the Community Manager at Hitachi from late 2005-late 2006. I realize I’m supposed to put this on the wiki, so I’ll make sure there’s a link pointing to it, Interesting session here at the community Unconference on ‘how to deal with trolls’. A few case studies suggested that learning to listen to the troll, and ask them ‘do you know what you’re doing’? -If someone disagrees with folks, or is erroneous, you need to have your community guy correct the content with a follow-up comment. -Remember that the forums are for users, and for the community, so the more you clamp it, the less success you may have, as they could build their own. Question: Is a snark a troll? What if their sarcasm is actually speaking the truth? This was a session that I lead and encouraged feedback, I got a ton of knoweldge that will apply to future events that I do, as you may know, I’ve held events at Hitachi, Lunch 2.0 and was involved with the famous BlogHaus with PodTech. What’s a community event? It’s like an open house, or as I was quoted in by the SFgate, a tupperware party! -Multiple touchpoints are required, offline events don’t just happen, other things occur, smaller groups will segment. -Don’t exploit community, don’t force them to take pics, blog, or do un-natural things. -Best way to promote event? Invite influencers who will ‘sneeze’ for you. -Don’t pitch to them, make presentations opt-in. Better yet, consider creating feedback sessions where customers can play, hack, or improve products. -Try an online event first, watch relationships form, let community define objective –a great precursor. -Externally (maybe corporate blog) and capture event, pics, and link to others. -Example of how communities have apprenticeships, however in today’s communities the apprentices may learn more from each other, rather than from the master. -Some of the local connections may have better communities. -Case Study: Cisco launched 12 communities, much of the success occurred as users were able to self-identify and be experts. -Case Study: Microsoft Support, Reward influencers, knoweldge providers by giving them ratings, gifts and join programs. -Case Study: Xerox brings new people to the community, and wants them to share their outside experiences to the collective. There was also a vendor speed dating session, where the vendors (I represented Podtech) sat at a table and attendees would come by to learn more about what you do. My head spun, I met so many people, it sometimes takes a few minutes to explain the PodTech network, but I’m confident everyone understood very clearly after we talked. At the end of the event wine was given to folks who helped contributed, then it was turned over to the community to nominate community members that had contributed quite a bit. Very interesting to see how folks would kudos to different people. Above: Video of the final session, you can hear all the ‘key nuggets’ that the community uncovered.